If you are looking for a permanent replacement for missing teeth, dental implants offer an effective solution that will look and feel as natural as your original teeth. Unlike dentures, dental implants are artificial roots placed in the patient’s jaw bone. As bone and gum tissue grow around the dental implants, they serve as permanent anchors so that Dr. Susie Ang can build life-like ceramic restorations around them. Aside from providing an attractive and natural result, dental implants help maintain bone, improve chewing performance, and prevent teeth from changing positions (preventing future bite problems). 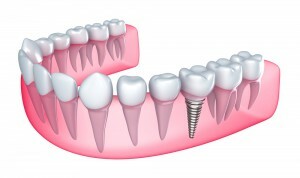 Dental implants offer patients an attractive alternative to dentures.